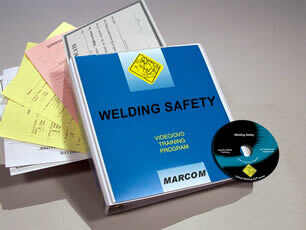 Description: MARCOM's "Welding Safety" Videotape Program reminds employees that there are indeed a number of hazards associated with Welding, and provides the information that they need to work safely when involved with Welding operations. People have been welding in one form or another for over 2,000 years. But like many industrial processes, Welding can be very dangerous. 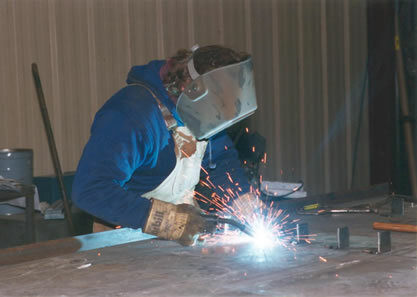 Whether an employee is working with the hazardous gases of an "Oxyacetylene" unit... the high voltage of "Stick Welding"... or the combination of gas and electricity that powers "MIG" and "TIG" operations... flying sparks, toxic fumes, electric shock and high temperatures are just some of the things that can make Welding a dangerous proposition. The Videotape includes information on getting "authorization" for welding operations, sparking and the risk of fire, guards and protective barriers, hazardous fumes and ventilation, the use of respirators, eye protection (welding helmets/filters/ glasses/goggles), using other personal protective equipment, inspecting welding equipment, proper welding safety procedures, and more. The Videotape Program comes with a comprehensive Leader's Guide, reproducible Scheduling & Attendance Form, Employee Quiz, Training Log and Training Certificate. Excerpt: Every day welders in various industries use high temperatures to shape metal. Sometimes the metal is bonded together; other times its cut apart. Over the years engineers have developed a variety of methods of welding for welding. The combination of a spark, oxygen, and a flammable gas provide the energy for oxy-fuel cutting, welding, and grazing. High voltage electricity, whether it’s used alone or used in tandem with various gases, powers ARC welding. Because of the heat and materials involved. These welding methods can all be very hazardous, but no matter which type of welding you’re working with there are things you can do to work safe. The first thing to do is to inspect your equipment. When you’re working with an oxy-fuel unit make sure your torch has the right tip for the job at hand. Examine the cylinder valves and fitting. These must be clean and clear before you connect the torch and hoses. Once everything is set up apply a soap solution to check for gas leaks. Some problems can be solved by simply tightening the connection.